More and more users, a high device density and mobile applications present ever new challenges for Wi-Fi infrastructures. Low bandwidths and long load times are often the result. IEEE 802.11ac Wave 2 access points give your Wi-Fi a major boost in network performance and efficiency. Now you benefit from wireless freedom combined with the performance of wired networks—for a unique Wi-Fi experience. The second generation of the IEEE 802.11ac Wi-Fi standard, Wave 2, has new functions over the former Wave 1: Extra-broad transmission channels, four spatial streams and Multi-User MIMO (multiple input, multiple output). This increases the maximum throughput to 1.7 Gbps. All of the clients take turns to transfer data and, depending on the client, some of the available spatial streams may be unused. So far access points only supported the classic Single-User MIMO technology. With Single-User MIMO all available clients will take turn one after another, meaning only one client can receive or transmit data at a time. Since a simultaneous provision of clients is impossible, availabale spatial streams are likely to be unused. 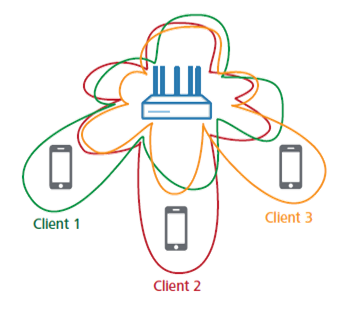 Multi-User MIMO (MU-MIMO for short) allows the spatial streams of an access point to be shared between different clients. With MU-MIMO, several clients can be provisioned simultaneously, and the overall bandwidth available for parallel data transmission is increased. For example, MU-MIMO enables an access point with 4x4 MIMO to divide its four spatial streams in parallel between a 2x2 MIMO client and two further 1x1 MIMO clients (such as a notebook or smartphone). This makes the most efficient use of all available spatial streams. 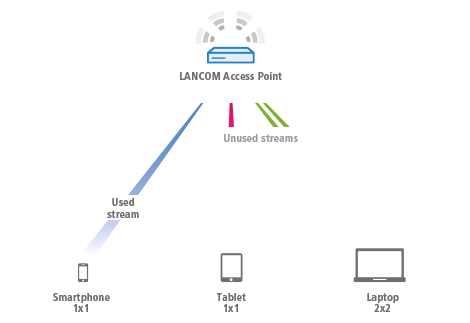 Beamforming enables an access point to control the strength of the signal in relation to the direction. For example, certain clients can be offered a particularly good connection while the other clients not using the signals are subjected to less interference. In combination with MU-MIMO, the various clients receive dedicated spatial streams with a minimum of interference, which has a positive influence on the available gross data rates for all of the clients. The enhancement of MIMO to 4x4 with up to four spatial streams is a logical step towards expanding the capacities provided by IEEE 802.11ac. With 4x4 MIMO, the gross data rate can be improved by a further 33% in comparison to Wave 1. A further increase of channel width up to 160 MHz doubles the performance yet again. This is implemented either with a single 160 MHz channel or by combining two directly adjacent 80 MHz channels in order to achieve the corresponding performance. Thanks to IEEE 802.11ac Wave 2 the possible performance of WLAN networks has launched into a new dimension. Thus, offices can be networked completely wirelessly – with the Gigabit speed of a wired network. The time- and cost-intensive wiring of offices belongs to the past. Thanks to the new standard IEEE 802.11ac Wave 2 data transmissions for 11ac-capable end devices with 1x1 MIMO is accelerated to up to 867 Mbps. This increase in speed is a big surplus especially for mobile clients such as tablet PCs or smart phones since the significantly shorter data transmission time leads to an increased battery lifetime. 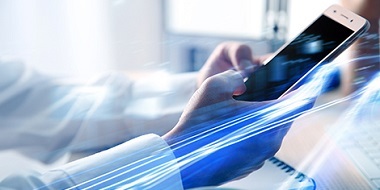 Applications with a high demand for bandwidth, so far only realizable via stationary cable networks, are now wireless and flexible due to the new WLAN standard IEEE 802.11ac Wave 2. As a consequence, you can, for example, arrange telepresence applications location-independently without any loss of quality. 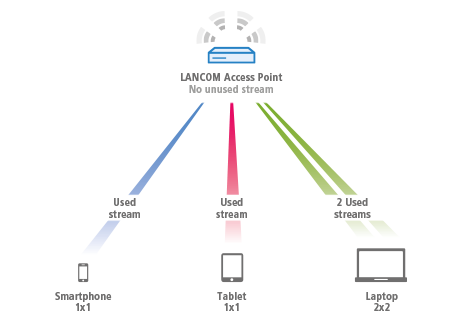 LANCOM access points with 11ac support are equipped with two WLAN radio modules. Therefore, both 11n clients (via 2.4 GHz) and the modern 11ac clients (via 5 GHz) can be provided with high-speed WLAN. Thanks to MU-MIMO, Wave 2-enabled clients can now transmit data simultaneously, rather than one after the other as in the past. Rising demands for bandwidth are met even in high density environments. Would you like to learn more about technologies from LANCOM? We would be happy to advise you.